Item number Sf845 from the MOA: University of British Columbia. 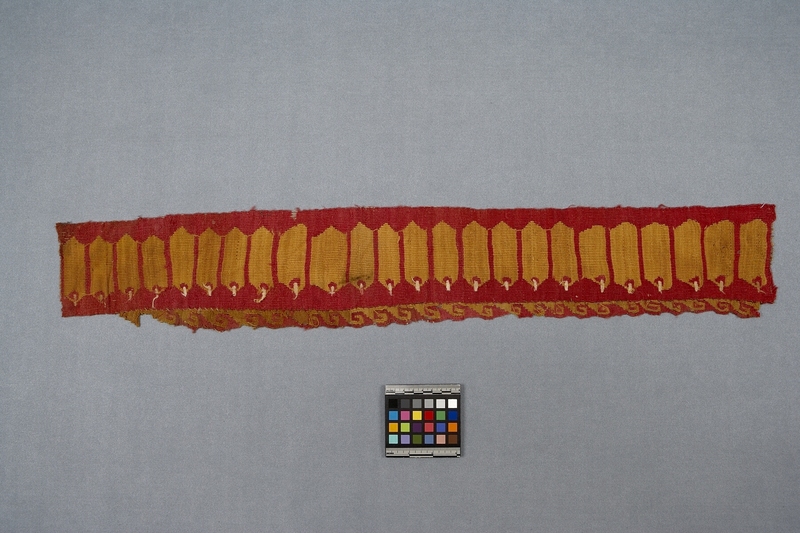 Strip of red slit tapestry with a woven design of large, closely spaced yellow feathers. A separately woven tapestry band of yellow and red interlocking step frets is sewn to one long side. No warp selvedges are present but parts of all weft selvedges are. The colours and technical features are typical of Chancay tapestry (Rowe), but the feather motif is usually associated with Inca Period fabrics (p.c., Alan Sawyer). A late Chancay sash (Tsunoyama, pl.1) has feather and interlocked spiral motifs in the same range of colours. The feather motif has an obviously avian connotation.